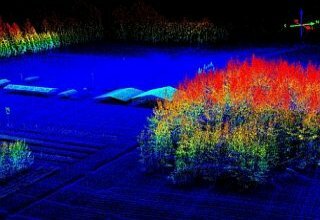 Scion, New Zealand's CRI for forestry and wood products,has a new top-of-the line lidar scanner - the Riegl MiniVUX-1 UAV Snoopy V-series manufactured by LidarUSA. The new piece of equipment has higher resolution and accuracy than Scion's current scanner, and has an increased range. Being able to capture data at greater than 60 m above ground (and up to 120 m) means line of sight UAV flying is much easier, and the UAV is safely clear of tree tops. A two-day session with a trainer from LidarUSA was also attended by representatives from the University of Canterbury, Interpine Innovation, and Pilbrow Surveying Ltd. Robin Hartley, Scion's UAV Operations Manager reported that it was very impressive to see a system that could capture good lidar data 120 metres above ground. "Our first impressions are that the new system is far superior to our current Lidar system, and it is significantly easier to integrate and operate, and to generate usable data," says Robin. The new scanner will be a powerful addition to Scion's Forest Informatics team's tool kit for its work on monitoring tree growth, health and inventory, and in the phenotyping research programme. Contact Robin if you have any questions: robin.hartley@scionresearch.com.